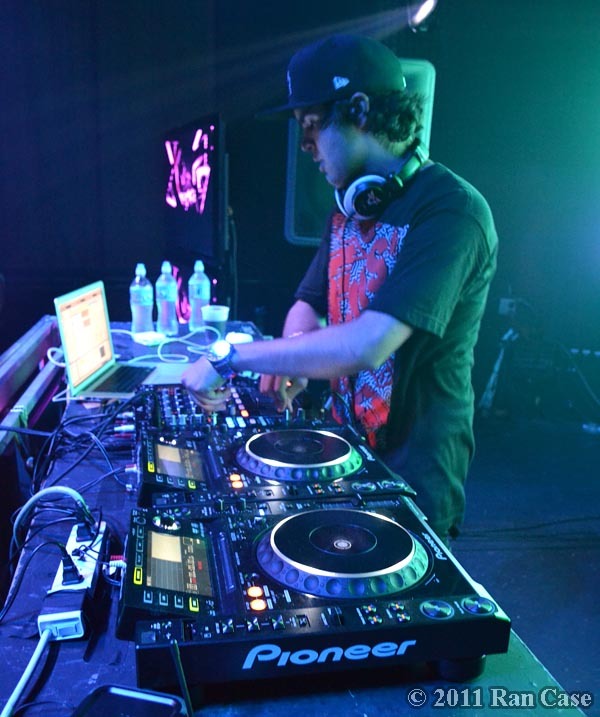 Datsik’s internationally-known for his dubstep, but the almost casual house party atmosphere of his weeknight show wouldn’t have given that away. After Doverspike and Buku got the ever-increasing crowd moving and local favorite Sean 2:16 thrashed them properly, Datsik took the stage to melt everyone’s faces. People brought him gifts–hand-made shirts, a bright rainbow plastic candy bracelet that he immediately put on and wore through the rest of the show–and after the first few fans popped up on the stage to give him high-fives, he came around the tables to give high-fives to the entire front row. Twice. This is a guy who values his fans: he stuck around after the show as well, shaking hands, giving hugs, and taking pictures, where other artists have been known to immediately skitter off the stage and out into the night. Add on the DJ skills and the tendency to produce tracks that make you sit back and gleefully go, “Ohh, that’s sick,” and it’s no wonder this guy’s become a force to be reckoned with. This entry was posted on Sunday, October 2nd, 2011 at 2:18 pm. It is filed under Concert Photography, dubstep, Music, Photos and tagged with buku, doverspike, dubstep, electronica, live, local, music, Pittsburgh, sean 2:16, show. You can follow any responses to this entry through the RSS 2.0 feed.